Our popular GTN 650/750 series of touchscreen avionics received a number of added features and capabilities tailored to the helicopter market. These additions add to an already popular line of products focused on improving cockpit awareness and continued ease of operation. WireAware is the first of those enhancements, this new feature graphically overlays power line location and relative altitude information on the moving map and terrain pages of the GTN. Power lines are depicted in colors corresponding to their height relative to the helicopter's altitude so it's easy to identify those posing a threat. We also added our new FastFind feature, which makes flight plan entry and waypoint selection easier, and incorporates predictive logic to suggest airports and waypoints using current GPS location. Next, we streamlined the frequency entering process with our new Simple Frequency Entry and Identification system. Frequencies may now be entered without the leading number "1" and trailing zero(s), making the process faster and easier. For those who utilize the Garmin Aviation Checklist Editor on a PC, you now have the option to create custom checklists for display on the GTN 650/750 series. After saving a checklist to a Garmin data card and inserting it into the GTN, it can be viewed on the touchscreen display. Flight plans and waypoints can also be stored in the GTN flight plan catalog for added convenience. For helicopters flying search and rescue missions, the GTN series can now automatically generate flight plans using four search patterns: Parallel Line Search, Expanding Square, Orbit or Sector Search patterns. A new fuel range ring can also be overlayed onto the moving map, displaying the remaining flight distance relative to the amount of fuel on board. We also added animated NEXRAD imagery, interpreted from different sources including the GDL 88, GDL 69 and GSR 56, making the weather-related decision-making easier. 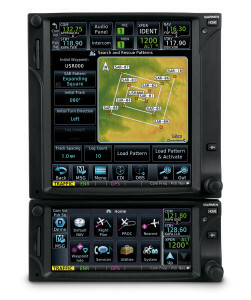 For more information on the new helicopter features for the GTN 650/750, visit www.garmin.com/helicopters or contact a local Garmin authorized dealer.